We believe that enzymes can tackle some of the biggest challenges facing synthetic chemistry. Recently we have begun to engineer enzymes to produce valuable building blocks for the synthesis of bioactive compounds. Noncanonical amino acids (ncAAs) are important components of natural and artificial products; they are also useful tools for chemical biology. Enzymes can produce ncAAs with pristine enantioselectivity, without the need for protecting groups or expensive reagents. To create a scalable enzymatic platform for synthesis of Trp analogs, we identified a TrpB subunit of the tryptophan synthase (TrpS) complex and engineered it to function as an independent enzyme. This stand-alone enzyme has served as the basis for making a panel of catalysts that have been applied to make more than 50 different ncAAs (and counting)! “Directed Evolution of the Tryptophan Synthase β-Subunit for Stand-Alone Function Recapitulates Allosteric Activation” A. R. Buller, S. Brinkmann-Chen, D. K. Romney, M. Herger, J. Murciano-Calles, F. H. Arnold. Proceedings of the National Academy of Sciences 112, 14599-14604 (2015). doi:10.1073/pnas.1516401112. “Synthesis of β-Branched Tryptophan Analogues Using an Engineered SubUnit of Tryptophan Synthase” M. Herger, P. van Roye, D. K. Romney, S. Brinkmann-Chen, A. R. Buller, F. H. Arnold. Journal of the American Chemical Society, 138, 8388-8391 (2016). doi:10.1021/jacs.6b04836. 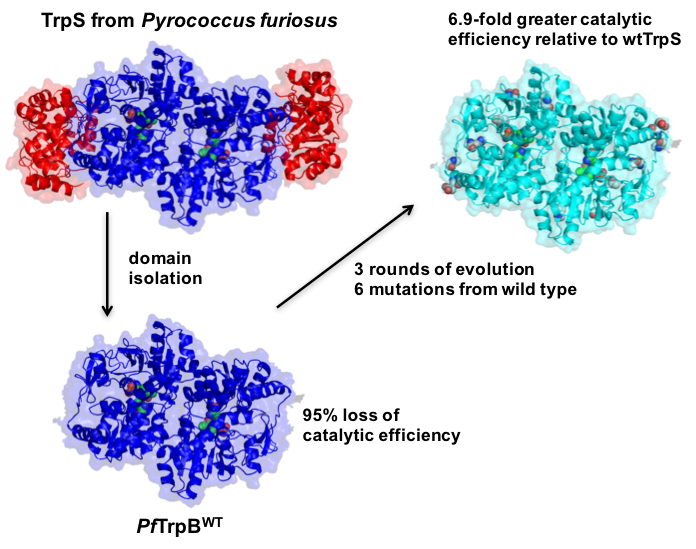 “A Panel of TrpB Biocatalysts Derived from Tryptophan Synthase through the Transfer of Mutations that Mimic Allosteric Activation” J. Murciano-Calles, D. K. Romney, S. Brinkmann-Chen, A. R. Buller, F. H. Arnold. Angewandte Chemie 55, 11577-11581 (2016). doi:10.1002/anie.201606242R1. “Tryptophan Synthase Uses an Atypical Mechanism To Achieve Substrate Specificity” A. R. Buller, P. van Roye, J. Murciano-Calles, F. H. Arnold. Biochemistry 55, 7043-7046 (2016). doi:10.1021/acs.biochem.6b01127.